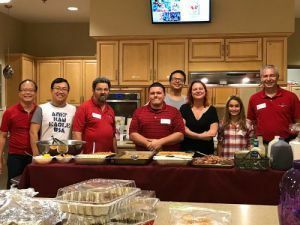 Members of the Pensacola State College Student Support Services Club recently prepared dinner for families at the Ronald McDonald House of Northwest Florida. To date, the Ronald McDonald House has served more than 20,000 relatives of children who have traveled to Pensacola for medical treatment. With generous donations from the local HoneyBaked Ham and the TRIO SSS Club fund, Pensacola State students were able to cook dinner for more than 50 people. The families at the house were very thankful to the students and HoneyBaked Ham. “Thank you for providing dinner for us and helping the Ronald McDonald House feel like a home away from home,” said Deanne H. of Jacksonville. Santiago added the Student Support Services Club plans to prepare another meal for Ronald McDonald House families during the spring semester. “We need all of the help we can get and welcome other clubs who want to participate,” he said.